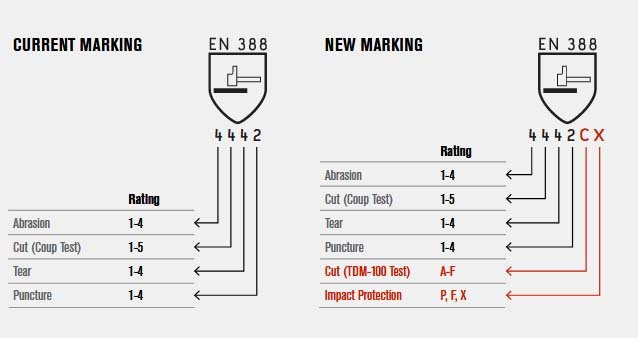 Currently, on many cut resistant gloves, you will find the EN 388 marking. The EN 388, similar to AN/NZS 2161.3 2005 Occupational Protective Gloves Standard, is the European standard used to evaluate mechanical risks for hand protection. 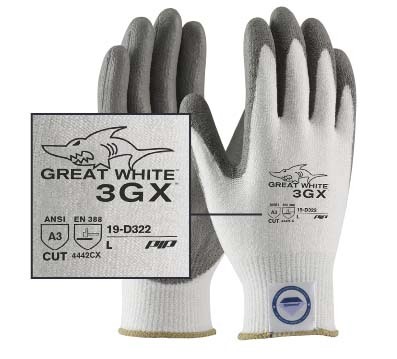 Gloves with a EN 388 rating are third party tested, and rated for abrasion, cut, tear, and puncture resistance. Cut resistance is rated 1-5, while all other physical performance factors are rated 1-4. Up until now, the EN 388 standard used only the “Coup Test” to test for cut resistance. The new EN 388 2016 standard uses both the “Coup Test” and the “TDM-100 Test” to measure cut resistance for a more accurate score. Also included in the updated standard is a new Impact Protection test. As discussed above, the most significant change to the EN 388 2016 standard is the formal inclusion of the ISO 13997 cut test method. ISO 13997, also known as the “TDM-100 Test”, is similar to the ASTM F2992-15 test method used in the ANSI 105 standard. Both standards will now make use of the TDM machine with the sliding blade and weights. 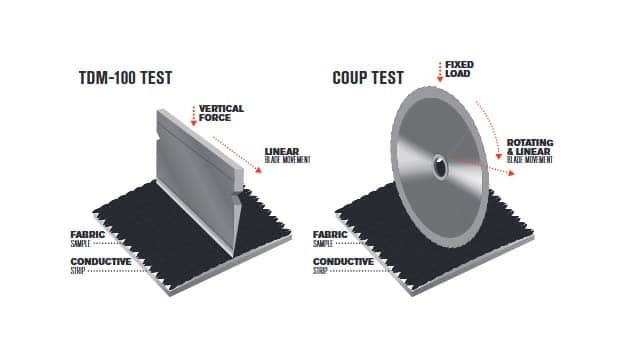 After many years with differing testing methods it was found that the blade used in the “Coup Test” would dull quickly when testing yarns with high levels of glass and steel fibers. This resulted in unreliable cut scores, so the need for including the “TDM-100 Test” to the new EN 388 2016 standard was strongly supported. The updated EN 388 2016 standard will also include an impact protection test. This test is intended for gloves designed for protection against impact. Gloves that do not offer impact protection will not be subjected to this test. For that reason, there are three potential ratings that will be given, based on this test. 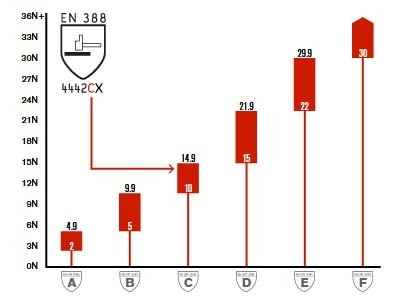 To differentiate between the two cut scores that will be generated under the new EN 388 2016 standard, the cut score achieved using the ISO 13997 test method will have a letter added to the end of the first four digits. The letter assigned will depend on the result of the test, which will be given in Newtons. The table to the left outlines the new alpha scale used to calculate the results from the ISO 13997 test method. PIP has been testing all of its cut resistant gloves with the TDM-100 machine since 2005, which is (and has been) compliant with the new test method, enabling us to easily convert to the new the EN 388 2016 standard. 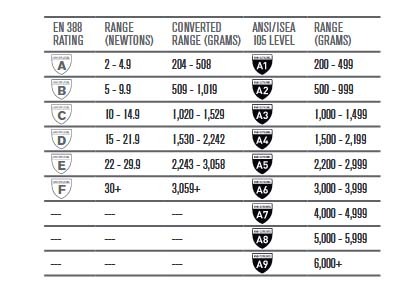 The table to the left illustrates how the new EN 388 2016 standard is now in-line with the ANSI/ISEA 105 standard for cut resistance when converting Newtons to grams. 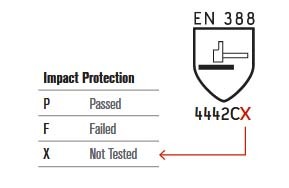 All PIP products with the EN 388 shield printed on them will be updated as the new norm becomes ratified by each country and new production orders are placed. We anticipate this will begin to happen in late 2017. The new sheild will be easy to identify as it will carry a 6-digit score rather than a 4-digit one.